Professional Cleaning in the Spring can help avoid allergy flare ups! The professional Cleaning Crew at Offshore Carpet Cleaning can help you and your family avoid allergy problems this spring by taking effective steps. Professional cleaning of your carpet, hardwood floors, tile and upholstery can make sure harmful allergens do not get into the air and affect your family. A clean house can help you avoid allergies. Unfortunately, cleaning in itself can trigger the release of allergens. Additional cleaning and be effective in between visits to ensure you are still healthy and safe. But by following these professional tips from Offshore Carpet Cleaning and it can be very easy for you to avoid this dilemma. Dusting baseboards, pantries, and cabinets is a sure way for you to release dust particles. And while many homeowners want to sneeze their way to a clean house, professionals provide simple methods that you can try so you can clean up your house properly without triggering different kinds of allergens. The first thing you need to do is to recognize your allergy triggers. Homeowners need to undergo testing in order to identify specific allergens. This can help you formulate a more systematic approach when it comes to cleaning. This will also allow you to get the right allergy shots later on. Make use of HEPA filters where ever possible. Instead of dusting cabinets and shelves, professionals suggests that you vacuum your house using a product that has a HEPA filter instead. It would also be best if you let someone who has no allergies do the cleaning for you. But if this is not possible, it would be best for you to wear a mask, goggles and gloves so you can avoid allergies during cleaning. Dust particles can be pretty difficult to deal with. Unfortunately, it can easily become the least of your concerns especially when you have mold or mildew around. Freestanding water can present a mold hazard. This is why dealing with leaky pipes and faucets need to be prioritized. Should windows be opened or closed? Experts agree that when it comes to windows, it should be opened during house cleaning, but closed as tightly as possible during allergy season. People with allergies can suffer from irritations especially during cleaning. Cleaning solutions can have harsh odors and chemicals, which is why the house has to be ventilated properly. However, if pollens and ragweed found outside are your allergy triggers, then closing your windows during spring is a must. Fragrances, no matter how wonderful they may be can greatly exacerbate allergies. By avoiding cleaning products which contain harsh chemicals or strong fragrances, you can clean your house properly without getting an allergic reaction. Depending on what your allergies are, you can avoid using bleach, use green cleaning products, or opt to use hydrogen peroxide instead of harsh chemicals when dealing with molds. When it comes to dust, a lot of homeowners just love to use the feather duster. Unfortunately, this product will only help release dust into the air. But by using a damp microfiber cloth instead, you can trap the dust and get rid of it properly. Clean your house and the items within the home using a standard operating procedure. Always clean from top to bottom, inside then outside, and from left to right. Doing so helps you save time and energy, and it can also help you avoid exposing yourself from allergens unnecessarily. Though the bedroom is rarely seen by other people, it is important that you spend time cleaning your room as well. The bedroom needs to be your sanctuary, and because you spend a lot of time there, you need to make sure that this area is also free from dust and from other allergens. If a dirty house drives you crazy, and if dust and molds are just too much for your allergies, experts highly recommend that you hire professional cleaning services. You can ask expert house cleaners to clean and sanitize the entire house for you, or you can also ask them to focus only on the specific problem areas of your home. Offshore Carpet Cleaning is owner operated so you can count on top not service every time. We offer emergency 24 hour service as well as : restoration, water removal, window cleaning, contractor management, storm checks, rental property oversight, furniture and upholstery cleaning, tile and grout, area rugs, business cleaning, daily cleaning or weekly cleaning of your commercial property. We are located in southern New Jersey and offer these services for all of Cape May County and Atlantic County. Including Atlantic City, Margate, Linwood, Absecon, Brigantine, Ocean City, Atlantic City, Linwood, Northfield, Egg Harbor Township, Hammonton, Vineland, Marmora, Sea Isle City, Cape May, Avalon and surrounding areas. You Property Service Company at the Shore. $189* Residential Carpet Cleaning Special now through April 13, 2017! Ready for that spring clean up? Offshore Carpet Cleaning is offering a carpet cleaning special deal now through April 14, 2017. For 4 rooms and a hallway you’ll only pay $189! Up to 500 sq. feet of carpet! This is the best time to kick off summer and freshen up to your home. Our deep cleaning equipment is sure to make a huge difference in the look and the smell of your home. By calling Offshore Carpet Cleaning to clean your carpets you are ensuring a safe environment for you family and visitors. Our hi temperature sanitation will kill germs and bacteria that have accumulated in your indoor space over this winter. You will have a sense of satisfaction knowing you are keeping the safe and healthy. Offshore Carpet Cleaning is owner operated so you can count on top not service every time. We offer emergency 24 hour service as well as : restoration, water removal, window cleaning, contractor management, storm checks, rental property oversight, furniture and upholstery cleaning, tile and grout, area rugs, business cleaning, daily cleaning or weekly cleaning of your commercial property. We are located in southern New Jersey and offer these services for all of Cape May County and Atlantic County. Including Atlantic City, Margate, Linwood, Absecon, Brigantine, Ocean City, Atlantic City, Linwood, Northfield, Egg Harbor Township, Hammonton, Mays Landing, Vineland, Marmora, Sea Isle City, Cape May, Avalon and surrounding areas. You Property Service Company at the Shore. *Offer applies to Carpet Cleaning only up to 2000 sq. ft. Extreme pet damage could affect pricing. We clean furniture! Offshore Carpet Cleaning Cleans Upholstery, Fabrics and more…..
Offshore Carpet Cleanings mobile steam cleaning process can be performed on many types of furniture upholstery and fabrics without affecting the underlying structure. Our technicians will evaluate the status of the furniture piece before beginning and may need to perform some trials of the cleaning agents on a non-visible area of the piece to ensure compatibility. Stains may require pre-treatment to help lift them out of the material. After cleaning, we may opt to apply air movers to help speed or control the drying process if needed. When is the best time to get your furniture cleaned? When you are getting your floors cleaned of course! We can come a clean all your floors and also sanitize your furniture. Spring cleaning is the ideal time to take care of both of these things in your home. As the season change and allergies begin, it the prime time to fight off these issues. What better time to talk about Green Cleaning! Happy St. Patricks Day! 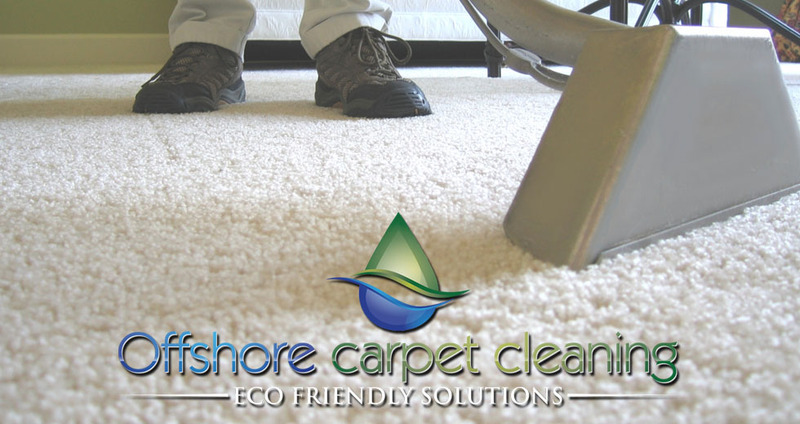 At Offshore Carpet Cleaning we take pride in the fact that we use ECO Friendly Green Products when cleaning your home of office floors. Knowing that you are not using product with harsh or harmful chemicals can make you feel great knowing your family, children, pets and friends will not be affected. Did you know that over 100 trillion bacterial cells consider your body their home? It’s true, and they outnumber your regular cells 10 to 1. These tiny guests live in your mouth, nose, and gut and they make up what is known as your microbiome – your highly personalized mini-ecosystem of both good and bad bacteria. We’ve become a nation obsessed with hand washing and sanitizing, hoping that all that scrubbing will keep us safe from colds, flu, and harmful bacteria. How did we get here? Back in the mid-90s, you had your choice of a few dozen antibacterial products; by 2001 that number had grown to over 700 and it hasn’t stopped since. Manufacturers everywhere saw a golden opportunity to capitalize on people’s fear of germs and inundated the market with soaps, shampoos, toothpastes, sponges, and wipes. They’ve even added antibacterial chemicals to clothing, housewares, mattresses, and toys. They’re low-allergenic and non-caustic, and they can be used on any surface. Green cleaning reduces your exposure to toxic chemicals and help rid your home of unwanted allergens. Overall indoor air quality is improved by reducing airborne dust and chemical gases. At Offshore we know you love your pets. We also know you don’t love their “accidents” or the dirt and germs they can track into your home. We understand and we can help. We use special stain removers and neutralizer to kill that smell and keep your home as clean as it can be. Don’t forget about getting your area rugs cleaned! People say I don’t have carpet….. but do you have area rugs? The best thing you can do for your area rugs is to call a professional rug cleaner who know how to handle the delicate fibers in your rug. Just like wall to wall carpet, family traffic and pets bring dirt and germs in and out of your home on a daily basis. Over time this build up can not only look dirty but harbor allergens, bacteria and more. Often times, people feel they can clean area rugs themselves. Just like wall to wall carpet you must give these rugs a deep cleaning every 18 months to remain germ free and sanitized. Using high temperature professional cleaning equipment ensures the elimination of unwanted contaminants. At Offshore Carpet Cleaning, we know that every area rug cleaning situation is different. We consider each rug prior to cleaning and chose a method that works best. We pick them up from your home and take them to our indoor facility to clean and dry properly and then return them to your doorsteps. From the most delicate rugs and and expensive orientals we’ve got you covered. Things you don’t think about- Germs & Bacteria; Viruses!! Offshore Carpet Cleaning – Carpet & Floor Cleaning and More! As the weather gets colder and we spend more time inside you should know what your family is exposed to! The Norwalk virus or Norovirus (virus that causes stomach flu) can survive on an uncleaned carpet for a month or more. Microbiologists have identified air blown from a running vacuum cleaner as one of the five places in the home that has the highest number of germs. Other places include dish sponges, washing machines, bathroom toilets during a flush, and kitchen trash cans. Each year, several pounds of soil can accumulate in and under a carpet. Offshore Carpet Cleaning can remove this from your carpets in one cleaning. The 5-second rule is a myth: bacteria can live after 4 weeks on carpet. And, thanks to “microbial adhesion”, germs such as the following are immediately transferred to food: Salmonella typhimurium, Salmonella enteritis (bacterium that causes horrible diarrhea and vomiting) and Campylobacter (causes bloody diarrhea, periodontitis or dysentery syndrome). Offshore Carpet Cleaning can sanitize and keep you healthy and safe. Bed bugs can live in carpet fibers and wooden floorboards. For their size, they are extremely fast and can crawl more than 100 feet to obtain a blood meal, usually at night from people who are sleeping. Engorgement takes about 3-10 minutes yet people rarely realize they are being bitten. Offshore Carpet Cleaning can remove these bed bugs and restore a safe environment. A person sheds about 1.5 million skin flakes an hour, most which becomes embedded in our carpets. Offshore Carpet Cleaning has equipment to sanitize and remove the things that we don’t think about… human skin flakes YUCK!! Carcinogens in cigarettes may accumulate in household carpet. Because dogs and cats, as well as children and infants, spend a great deal of time on the floor, they may be at risk for developing lung cancer in households with cigarette smokers. Even if smokers don’t live in your home, others can bring this into you home without you even realizing it and Offshore Carpet Cleaning will protect you. Reports of families falling ill with gastrointestinal problems because of leaky vacuum cleaners that re-deposited Salmonella germs from the carpet into the household air. Another huge benefit of Offshore Carpet Cleaning visiting your home and doing what they do best! Stachybotrys chartarum is a house mold that grows on wet carpeting. It produces mycotoxins which causes dermatitis, mucosal irritation and immunosuppression. Mold is ugly and cant effect us in so many unsuspecting ways, Offshore Carpet Cleaning should be your first call. Offshore Carpet Cleaning is a full service floor cleaning source for your home or business. As the best carpet cleaning service in Southern New Jersey, we service Atlantic County, Cape May County and Burlington County both commercially and residentially. We clean, carpet flooring, hardwood flooring, tile and marble plus, pet and water remediation with emergency response service. Offshore Carpet Cleaning is owner operated so you can count on top not service every time. We offer emergency 24 hour service as well as : restoration, water removal, window cleaning, contractor management, storm checks, rental property oversight, furniture and upholstery cleaning, tile and grout, area rugs, business cleaning, daily cleaning or weekly cleaning of your commercial property. We are located in southern New Jersey and offer these services for all of Cape May County and Atlantic County. Including, Margate, Linwood, Absecon, Brigantine, Ocean City, Atlantic City, Linwood, Northfield, Egg Harbor township, Hammonton, Vineland, Marmora, Sea Isle City, Cape May, Avalon and surrounding areas. You Property Service Company at the Shore. Water Removal for Commercial and Residential Properties. When living at the Jersey shore you never know when water damage will happen— even still it happens when you’re least expecting it. When it occurs, you obviously want to minimize the damage by acting as quickly as possible. Keeping your business up and running is the top priority. When your water emergency strikes, you need expert help to get the water out as soon as possible. Offshore Carpet Cleanings water removal-trained technicians are on call 24/7. They arrive on the scene with powerful, state-of-the-art equipment that extracts the water from your commercial or residential property. We understand how upsetting and uneasy you can feel when this type of emergency happens in your home or office. You want someone there quick to help you with your emergency and get things back to normal as soon as possible. Offshore Carpet Cleaning understand and will come when you call. When the Offshore Carpet Cleaning Experts arrive we will first assess the situation and second pump out any freestanding water. Offshore will also use powerful equipment to extract the water from your carpet, padding and upholstery. Our sister division Offshore Home Watch offers property management for your investment property, rental home or vacation home at the shore. As your contracted property manager we will be there when you need us for water emergencies, deep cleaning of any kind and contracting any additional services to ensure you are completely taken care of.